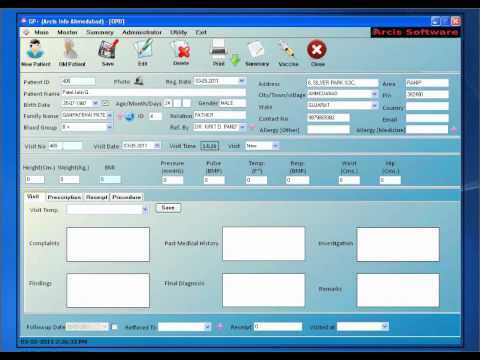 OPD+ is a clinic management software which helps small to medium scale clinics/hospitals/nursing homes, etc. operate effectively and efficiently by integrating the various activities to be undertaken in a clinic like OPD management, medicine stock management, administration, accounts, certifications, etc. Arcis Info, founded in 2009 in Ahmedabad, Gujarat, INDIA, is an IT development company, offering a wide range of services which range from development and designing that is covering almost all fields especially healthcare & medical in the best possible way. To be the best, the company knows what and how to beautifully present the a solution to client’s needs. Getting patient case history on single click. Prescription remarks in English, Gujarat, Hindi, Marathi language. Ready to use certificate formats. Easy to use for single user (doctor) and multi user (doctor). Increase patient personal touch with CRM SMS. Indepth summarized reports for management. Easy medicine stock management for dispensary clinic setup. Medicine Stock Management : Purchase, Sales, Current Stock Report. Managing your family or corporate patient account under group. Account : Receipt, Paid Unpaid Management (Patient & Familywise), 3C Register, Indepth Summarized Reports.